Would you like to host a HomeSpa party or Attend one? I present parties in Charlotte, NC and surrounding areas only. Invite your 10 best friends over for an afternoon of pampering. Email or Call me 704-588-7638 to book your HomeSpa party. Upcoming Parties and classes on Health and Nutrition will be posted on my Events page or on my blog. Please Check back often. Do you enjoy using spa and pampering products, but hate their high prices and added chemicals? You can learn how to make popular spa products at a fraction of the cost using NSP's 100 percent pure essential oils. These are the greatest gifts! It is so easy and inexpensive to put together gift baskets. Everyone loves to get these homemade treasures. Since ancient times, mankind has used pure plant essential oils for their healing benefits. Essential oils have many uses. Some are antiviral, antimicrobial or antifungal. Others may soothe inflammation, relax tense muscles or enhance breathing. Many popular products in stores today use additives and artificial fragrances. Discover how affordable it is to make your own luxurious and pampering products using Nature's Sunshine�s 100% natural, pure essential oils. Aromatherapy For Body, Mind & Soul , Aromatherapy Recipe Guide & Is your Home Safe? The following recipes are just a sampling of what you can find in these wonderful books written by Larissa Jones, Master Aromatherapist. These books are no longer available through NSP but you can buy them independently through Larissa by visiting her web site along or my blog links above. 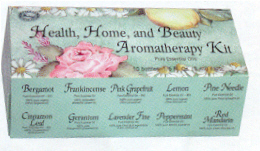 She offers other Aromatherapy products as well. Combine ingredients in a glass bowl and mix well. You can color this mixture bright yellow or orange with a little B-complex. Pour the mixture into a plastic bottle with a squeeze top. Put into a glass container that seals well. Add all ingredients and mix with the end of a wooden spoon. Put a drop of massage oil into each soap mold & spread around for easy removal of finished soap. Melt glycerin in microwave for approximately 30 seconds or until completely melted. (Use microwave safe measuring cup with pour spout.) Pour into soap mold, then drop oils on top of soap. Let sit until hardened. Combine essential oils with Sunshine Concentrate/soap in a trigger spray bottle. Spray on and wipe surface dry. Disinfects countertops, stovetops, and tile. *These kits provide a 20% discount off the regular price of purchasing these items separately. With this versatile collection of 10 of our most popular and useful oils, you can create hundreds of blends to handle everything from PMS to a dirty bathroom sink. The Health, Home and Beauty kit includes lavendar, bergamot, cinnamon leaf, lemon, grapefruit, geranium, frankincense, pine needle, mandarin and peppermint. Using the Aromaball is a Cinch! Simply place a few drops of your favorite essential oil(s) on the card, slip it into the diffuser and plug it in. The Aromaball comes with 10 replacement cards, so you can change scents any time you want.Try citrus oils to freshen your room and invigorate your mind. Or try a lavender blend that will help children relax before bedtime. The possiblities are endless...and the smells wonderful. 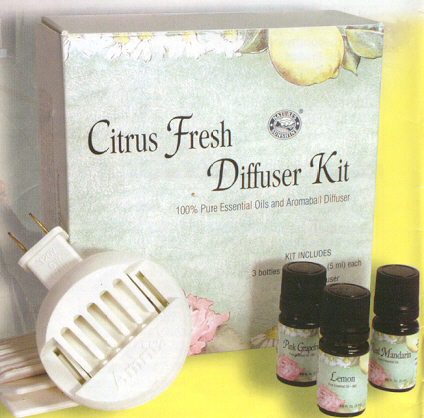 *The Citrus Fresh Diffuser Kit. With this kit, you can fill your home with the clean smell of pure citrus oils. Includes lemon, mandarin and grapefruit oils along with the plug-in aromaball diffuser and 10 aroma cards. Simply place a few drops of your favorite citrus scents on the aroma card, place it into the diffuser and plug it in. To change the fragrance, simply replace the aroma card. Here's everything you will need to start making your own pampering and cleaning products for pennies! Includes the Health, Home & Beauty Kit (lavendar, bergamot, cinnamon leaf, lemon, grapefruit, geranium, frankincense, pine needle, mandarin and peppermint), Sunshine Concentrate All Purpose Cleaner (32 oz), Aloe Vera Gel (8 oz), Massage Oil (4 fl. oz), 2 oz. bottle w/ sprayer, .3 oz. roll on bottle. Perfect for a room spritzer or body spray. It can also be used with a regular cap for massage oil blends. Use this bottle to apply your personalized aromatherapy blend. This bottle is perfect for blending essential oils. The funnel makes pouring massage oil easy and spill-free. 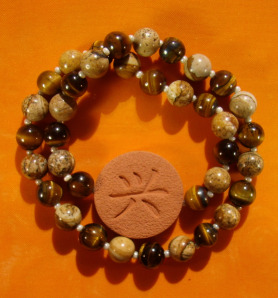 Terra Cotta Pendants' Necklaces and Bracelets - These Pendants are great to use with NSP's Essential Oils. Terra Cotta Pendants are hand made with kiln-fired terra cotta clay which absorbs the oil and then allows it to flash off slowly for the next 24-72 hours. Several essential oils should be in everyone's medicine cabinet. These include lavender, tea tree, peppermint, lemon, Roman chamomile and eucalyptus. Every mother will want to have Lavender on hand. It aids in the healing of burns, cuts, bruises, infections and insect bites, and it eases anxiety, trauma and hyperactivity. The effect of lavender on the pain and itching of an insect bite is almost instant, and the relief lasts about three hours. Lavender will disinfect a scraped knee while calming an upset child at the same time. Lavender also helps to prevent scar formation. Tea tree is another essential oil that everyone needs. Tea tree is one of the strongest disinfectant and anti-microbial oils available, yet it is also one of the safest. Tea tree is effective for fighting colds, banishing acne, soothing sunburn, stopping the itch from bug bites and as a general antibacterial. Tea tree also effectively kills fungus, yeast and mold. Use tea tree for any kind of fungal infection. You can use tea tree in the laundry as a disinfectant and deodorizer. It should be used with underwear when a woman has a yeast infection, when the socks are smelly, and to help disinfect other laundry (kitchen towels, hand towels and sheets). See the Aromatherapy Recipe Guide for a great recipe for freshening laundry. You'll want to have Peppermint oil close at hand. Just smelling its aroma straight from the bottle does wonders for nausea. One drop of peppermint can be taken internally to ease indigestion and stomach or intestinal pain. Peppermint has also been shown to be as effective as prescription medicine in easing the pain of migraine headaches. Use peppermint to ease headaches, fight flu and colds, and to freshen breath. Recipes for these ailments are found in Aromatherapy for Body, Mind and Spirit. Use peppermint in a sheet spray formula; it repels ants, fleas and who knows what else! This recipe can be found in Is Your Home Safe? One drop of Lemon essential oil can be added to drinking water to help purify it. Lemon is antibacterial and antiseptic, and you can use it in your household cleaning. Try adding 5 drops of lemon to your dishwater. Put some lemon in your mop bucket. Or put several drops of it on your vacuum bag and the smell will be released as you vacuum. See other recipes for using essential oils to clean your home in the Aromatherapy Recipe Guide and Is Your Home Safe? Both are available from NSP. Lemon is wonderfully uplifting, so keep it close when you may feel a little blue or overwhelmed. Often all you need to do is smell lemon right from the bottle to feel better. Roman chamomile is another versatile essential oil. It possesses anti-inflammatory and antispasmodic properties and will ease any type of cramping, whether from a spastic colon, menstruation or a pulled muscle. Rub as little as two drops of Roman chamomile (diluted in NSP Massage Oil) onto the effected area for relief. As an anti-inflammatory, chamomile is useful in treating strains, pulls, swelling, burns and arthritis. It is also calming and, like lavender, is a must-have for moms with small children. Mothers of infants should try the teething recipe on page 59 of Aromatherapy for Body, Mind and Spirit. Finally, Eucalyptus is a must-have essential oil for fighting colds and flu. It is wonderful for opening up congested airways. It is also a powerful expectorant, and it moves lung and sinus congestion so it can be eliminated from the body. Eucalyptus is a good insect repellant and it kills airborne bacteria when diffused into the air. It is also helpful for rheumatism. Chlorophyll - green.... is the green pigment in plants that harnesses the sun�s energy in photosynthesis. Chlorophyll performs metabolic functions in plants such as respiration and growth. Interestingly, the chlorophyll molecule is chemically similar to human blood, except that its central atom is magnesium, whereas that of human blood is iron. Liquid Chlorophyll may help improve immune response, deodorize the body and help cleanse the blood of impurities. The alfalfa plant, from which Nature�s Sunshine�s chlorophyll comes, is an excellent source of chlorophyll. Nature�s Sunshine offers chlorophyll in both liquid and capsules for varying needs. Beetroots - Red color can be made by pounding the tops of beetroots to extract a few drops of the juice. Fresh, dried herbs and flowers such as Lavender Flowers, chamomile, gardenia petals, rosemary etc. To keep drain from clogging fill stocking or cheese cloth when homemade products containing large pieces of dried materials. Limited Time ~ NSP Summer 2009 Special Oil Blend- Stock #3965-7 - Sunshine Blend Essential Oil. This special combination of essential oils reflects NSP�s outlook�sunny and warm! It contains 100% pure, cold-pressed essential oils from Lemon, Orange, Pink Grapefruit and Lime. This bright, clean aroma helps uplift, invigorate, inspire and bring balance to the body, mind and spirit. Click here to see Safety Guidelines for using Essential Oils. WE LIVE IN A TOXIC WORLD! LEARN TO REMOVE THOSE TOXINS AND POISONOUS CHEMICALS. CHANGE YOUR HEALTH AROUND! ! USE ALL NATURAL CLEANING PRODUCTS, ESSENTIAL OILS, PURIFIED WATER, STAINLESS STEEL WATERLESS COOKWARE AND BAKEWARE, BOOMERANG AIR AND SURFACE SANITIZER, WHOLESOME NUTRITION FOODS, PURE HERBS AND QUALITY SUPPLEMENTS. Hostessing ~ Invite your 10 best friends over for an afternoon of Pampering. Learn Healthy Lifestyle Changes you will want to implement into your life immediately. All attendees will learn to make All Natural perfumes, bath salts, spritzers and non toxic cleansers. Free gifts for guests. Hostess will earn free gifts according to party sales as well. Hostess chooses her own gifts from Nature's Sunshine product line. Presenting ~ Possibly you are interested in becoming an Aromatherapy Consultant and Presenting the Products at Home Spa Parties? Earn money with these wonderful Pure Essential Oils and NSP Products. Attending ~ Upcoming Parties for my self or any members in my Nature's Sunshine downline will be posted on my Events page or my blog. Please Check back often.